As freshet levels rose, water overtopped the stream banks where the original dike had been removed. Phase 1 of the Mission Creek Restoration Initiative (MCRI) is already providing flood protection and environmental benefits, according to project engineer Don Dobson and project coordinator Steve Matthews. “On April 22nd Mission Creek had an early freshet peak flow of about 67 cubic meters per second,” explains Dobson. “As that flow increased and the water level rose, water gradually overtopped the stream banks where the dike had been removed, allowing water to slowly flow across the floodplain.” As the water level across the floodplain increased, water started to flow back into the main creek channel near the west end of the project area. 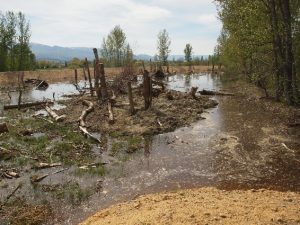 Water flowing into the newly expanded floodplain showed that natural function was being restored. upstream end of the project, and flowed back into the creek near the west end. 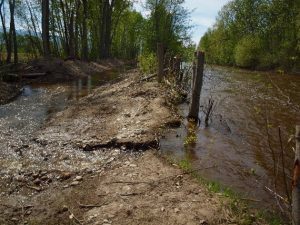 The new dike had water up to the toe of the dike and contained the water on the floodplain as planned.” Whether there will be further flow onto the floodplain this spring will depend upon the flows over the remainder of the freshet. Check out our Phase-1 Construction Fact Sheet and the MCRI video.